Every family needs to get away sometimes to reconnect. Cabin rentals in PA at Refreshing Mountain provide a perfect getaway, with plenty to explore in the surrounding area, along with an on-site swimming pool, hiking, zip-lining, and more. With no TV, you may be exploring extra ideas to occupy your family time. 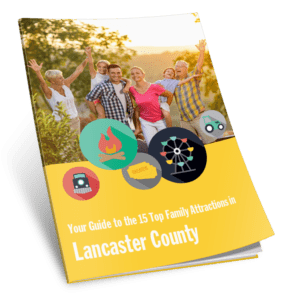 When you’re done exploring the many attractions available in the Lancaster area, the spacious cabins at Refreshing Mountain offer plenty of space to play games, both inside and out to hang out as a family. Board games provide classic family fun for all ages. The climate-controlled cabin rentals provide a perfect space to spread out and play on hot or rainy days. Every family has their favorites. …and other classic games are a great choice! These games are a great way to connect, providing entertainment and fun in a low-stress environment. From Go Fish to Poker, a deck of cards can bring hours of enjoyment to the whole family. If you need a little time away from the crowd, a game of Solitaire is a great way to unwind. You can also purchase specialty card games such as Uno or SET. If you have older teens and adults, Cards Against Humanity can bring hours of entertainment. The separate bedroom, kitchen, and living room areas in the cabin rentals ensure that the adults can stay up enjoying themselves long after the little ones have gone to bed. Another great family activity with cards is to build a tower of cards. See how high you can go before someone knocks it down! Make sure to pack a few extra decks for this activity. Jigsaw puzzles can be a great way to bring a family together. Young and old alike can work side by side to complete the picture. Just make sure you bring something you can complete during your stay, or a way to safely transport it home again. The luxurious cabin rentals provide plenty of space to leave a puzzle set up in the corner while still having room for all your other activities. Outdoor activities can be a fun way to pass a summer evening, making memories the children will remember forever. Set up a scavenger hunt around your cabin. Set the family off racing to find objects, treasures, and clues, and reward them with s’mores at the end. 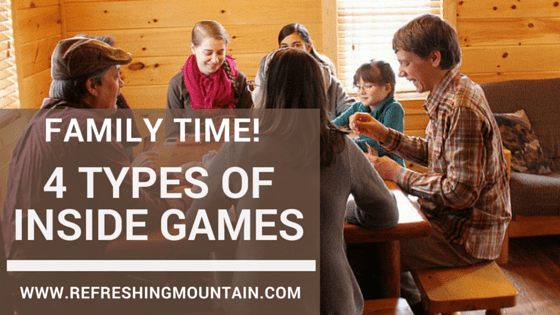 Refreshing Mountain provides a number of outdoor activities options for families, but there is also plenty of room inside and outside your cabin for family games. With everyday life so filled with electronics and video games, a vacation to unplug and get back to basics can really help your family connect. There is no shortage of family fun to have at Refreshing Mountain’s cabin rentals. Editor’s Note: This was originally published 6/26/2015, but was updated on 8/21/2018.